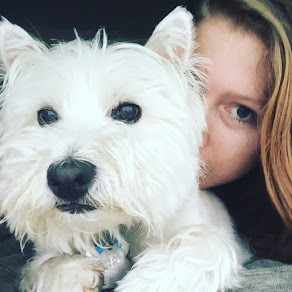 I spent all day yesterday in bed writing. I don't know what happened but the day got away from me and all I had done was write. I didn't make it to the gym or get to do the reorganization I had wanted to do. But I don't feel badly because I had so much fun writing and that's important to keep momentum going. I am, however, still writing non-sequentially, which is probably not the best idea, publication wise, but it's helping me keep at it. So what if I write the third book first and work backwards? Anyways, I had promised myself that if I finished the chapter I was working on then I would be allowed to bake something. I don't know why I haven't been working this way to begin with. Positive reinforcement is key, no? 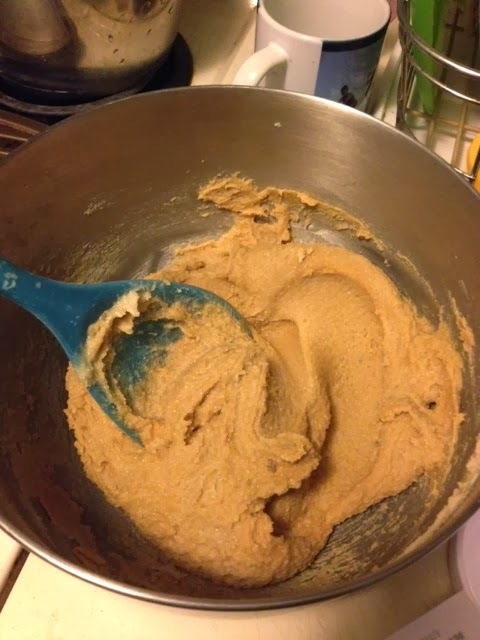 I decided to go with Peanut Butter Cookies (one of my favorites). It just occurred to me while writing the ingredients that I forgot the baking powder, so that is why the cookies are so flat. Whoops! Clearly I'm not meant to watch TV while baking because then my head isn't fully in it. I also used whole wheat flour. Typically this recipe uses white but I had wheat in the house so that's what I went with. It does change the flavor slightly, but it's totally your own preference. You could also use rice flour to make it gluten free. Combine all your wet ingredients first in a large bowl. Is there anything better tasting than sugar and butter? 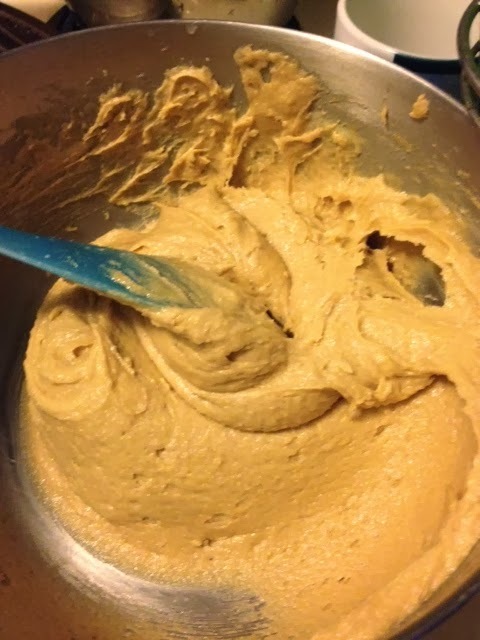 I didn't think there was until I tasted the batter after I'd added the PB. Amazing. 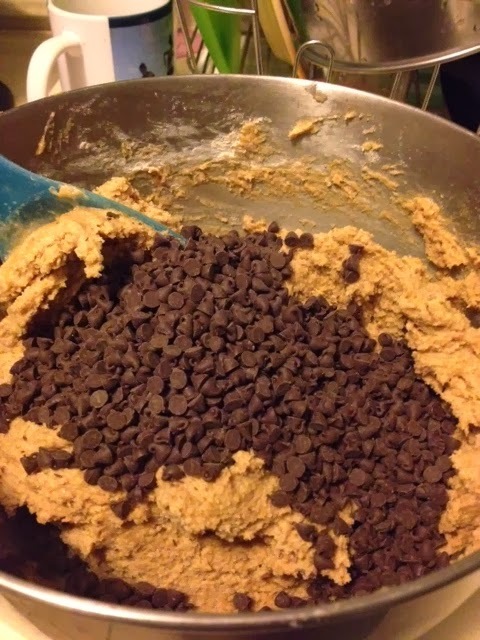 In a separate bowl combine all dry ingredients. Incrementally add the dry ingredients to the wet bowl mixing thoroughly between. Scoop small balls onto baking sheet and place two inches apart. 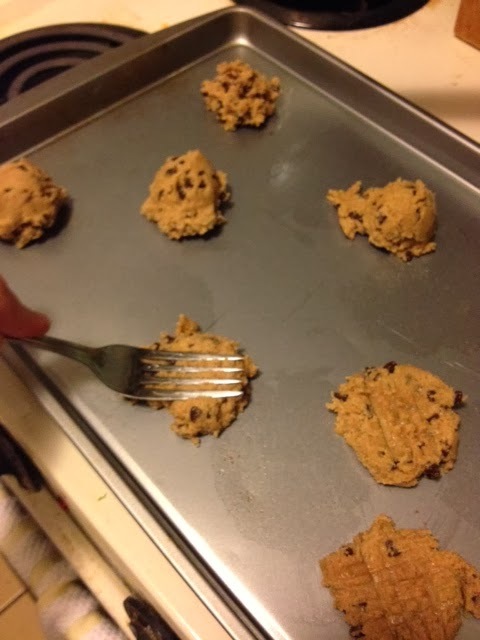 Take a fork, dip it in sugar, and press into dough. Bake for 10 minutes at 375 degrees F.
Typically you use Hershey's kisses to top of the cookies, however I didn't have any in the house. 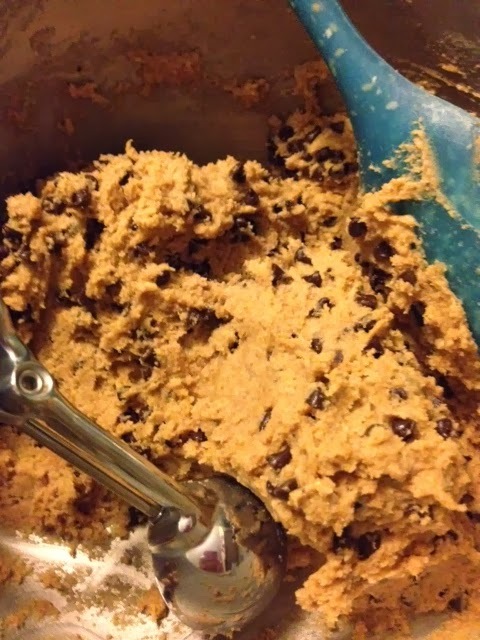 I did have mini chocolate chips leftover from another batch of cookies so I threw those in. It doesn't have the same aesthetic when they are mixed in, but chocolate and peanut butter is a good marriage no matter the format. 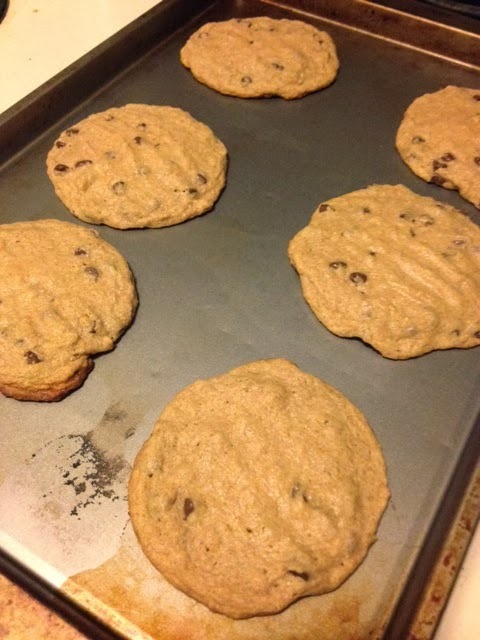 Should you actually remember to add in the baking powder your cookies will not be flat like this. 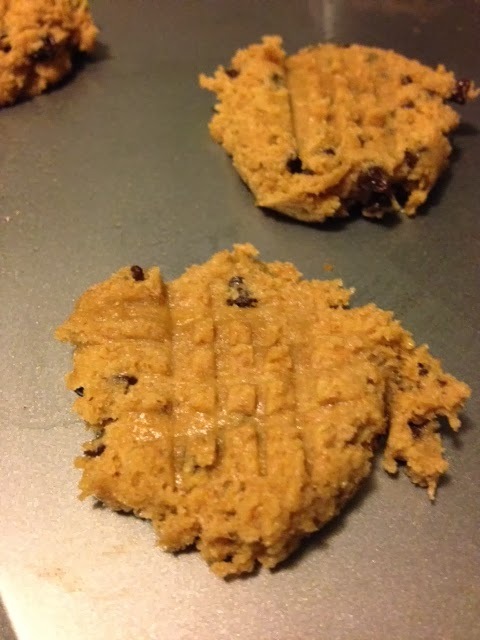 So I guess, if you prefer thin, flat cookies don't use baking powder and if you like thicker cookies make sure to add it. Hooray for finishing another chapter and these delicious cookies! Flat or fluffy, they still look delish! I have a feeling that after your months of restrictive eating everything is going to taste a thousand times better! Here's hoping!